Fold in the egg whites with the egg yolks mixture. Fold in a little at a time. It is important to not mix too fast. 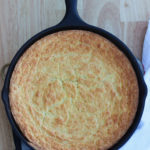 You want to keep the egg whites stiff enough so that the keto cornbread batter stay's fluffy.